Which Pocketfold would you like to see? Although we are pleased to be able to offer you a free sample, due to the sheer wealth of enquiries that we receive and the ever increasing cost of postage we do sadly have to charge P&P. Nevertheless, the sample service is very good value so please do take advantage of it. Simply complete the form above with your preference of Pocketfold type and colour, and if necessary feel free to choose a further two colours swatches to help you choose which is most suitable. NB: The sample service is limited to one per customer, sorry! Loved the Pocketfold Invites sample service. It really helped us to see the great quality of the Pocketfold and card before splashing out on a full order. The sample arrived quickly and was very well packaged. I thoroughly recommend this company for your invites. We decided to go DIY! I'm really happy with the quality of the pocketfolds and the card we ordered, also it was good to look at the made up options for inspiration. 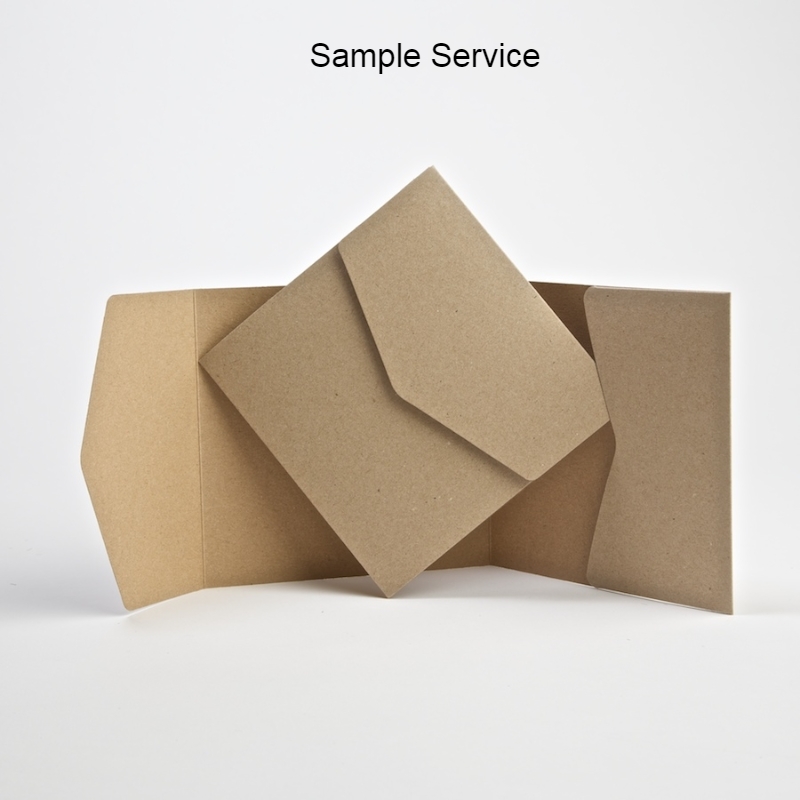 We used the sample service and ordered a couple of extra of the smallest inserts in various colours. The service was excellent, really quick with any queries answers promptly. Thank you for the sample it has saved me buying a full order and not being happy with the colour, the shade of Green is not quite right so I have ordered a swatch pack so I can see all the shades. I'm sure one will be right and then I can place my order.... Exciting times. Ordered a sample late Monday night and received it in Wednesday's post!!! Amazing servic and fab quality too. Will definitely be making an order for my wedding invitations. Thank you! Amazing service, amazing invites and amazing customer service. Chris has been such great help and very accommodating. Cannot wait to send out my perfect wedding invites! I ordered the sample service to start with as I wasn't sure on what the colours would like in 'real life'. 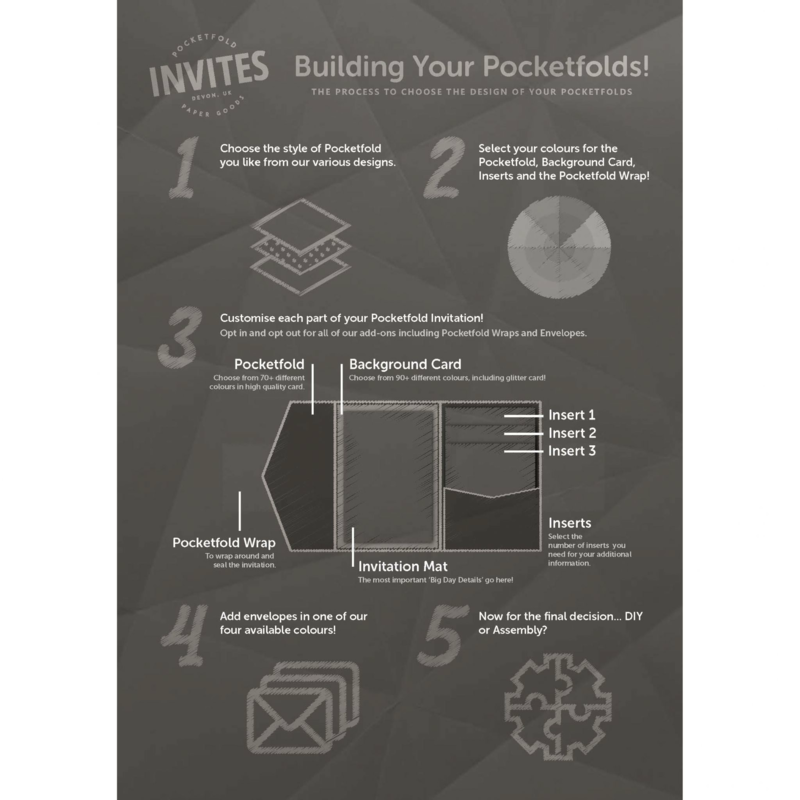 You get to choose a style of pocket fold invite and 2 insert coloured card. They sent me an extra coloured card which I thought was good of them, as it was pearlescent- which I actually went for in the end as fitted with the rest of the pearlescent card invites I ordered! You have to pay a small delivery fee for the sample service, but it's worth it and I totally recommend using this to see the invite first. It comes already made up to see the full effect. 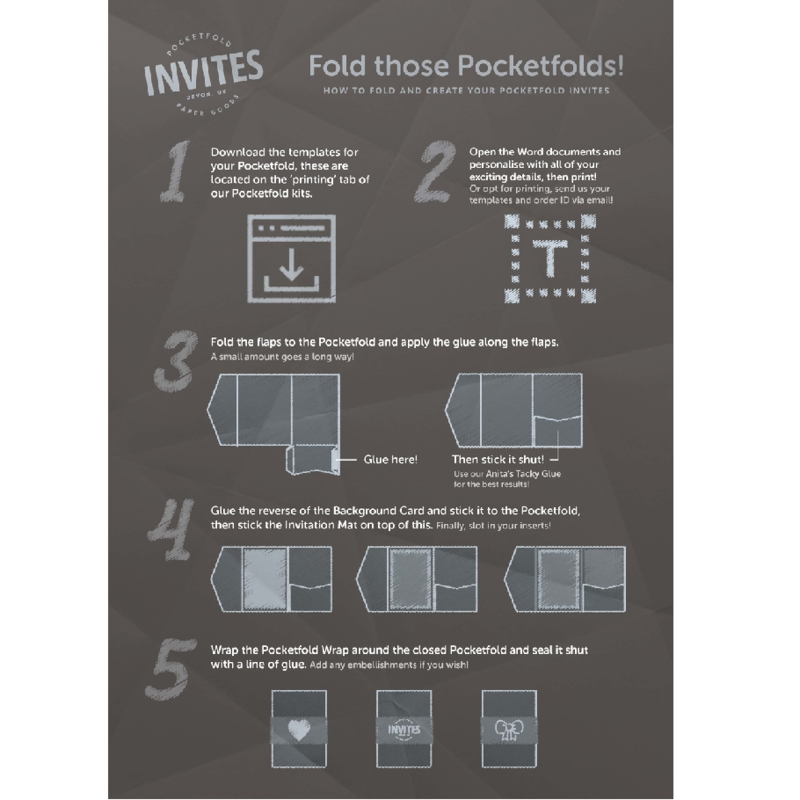 I went on to order my wedding invites from pocket fold invites. They are so helpful, and delivery is super fast and fab communication to keep you updated. I used the templates on their site which helped me create my own, and it was easy to use. If you need help then just ask them; they are always on hand! My order arrived today with my wedding invites with the printed inserts and I am super excited to put them together! (You can pay to have the invites made for you, but I wanted to have the experience of making them up myself so they came flat packed). Delivery was tracked, and an email sent so I knew when it was going to arrive. Thanks again Samara and everyone at Pocket fold invites!